Think of the toughest conditions most people would drive their car in. Multiply that by 10, and it still wouldn't be as tough as the conditions we just endured in Himachal Pradesh's Kaza, in Spiti Valley. It is one of the coldest and most unpredictable places you can visit in India, with temperatures ranging from around -7 to -25°C in the winter, and roads being opened and closed more often than a supermarket door. In fact, it gets so cold in the winter that it's quite a hotspot to go looking for the elusive snow leopard, which moves lower down the mountains and closer to the villages, to find food and water. But to go looking for one means driving about 550km from Chandigarh to Kaza via Rampur and Pooh, through a variety of terrain  smooth tarmac, broken tarmac, no tarmac, and then snow and ice. Not a task for the average car, I would say. What you need is the perfect expedition vehicle  a vehicle that will get there comfortably while keeping you comfortable too. 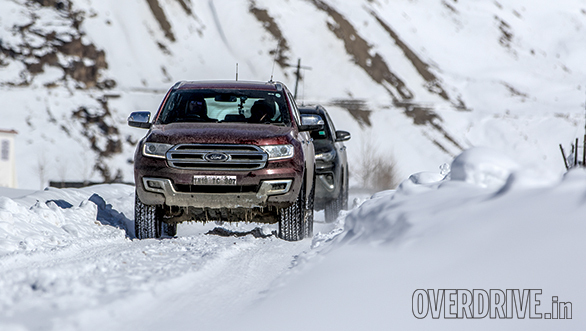 Enter the Ford Endeavour and the Toyota Fortuner. The previous-generation Fortuner was a favourite for such trips thanks to its rock-solid reliability and off-road capability. So expectations from the new one were very high. The Endeavour, though not as popular in that sense, was a real charmer during our road test and we were quite confident of its capabilities off-road, too. That said, we were still a bit nervous because not many people have dared to take vehicles like these to such locations in the winter. If something went wrong, the vehicle would probably be stuck there for the next couple of months till the snow cleared and made room for a flatbed truck. But hey, what's life without a few risks, right? Or so we convinced ourselves as we packed up and headed to Chandigarh. Of course, we did take some precautions before we left. Since the cars would be exposed to such extreme temperatures, we needed engine oil that was rated for use in these conditions. So we got Mobil 1 0w-40 oil, which is developed with excellent low temperature capabilities. We also carried anti-freeze for the diesel which would ensure our fuel lines don't get clogged with frozen diesel. But even before we began our journey, it seemed like it was over. Our expedition leader, Rana Siddhu, told us that the roads to Kaza were under four feet of snow, making it impossible to make it through. But with the hope that the Border Roads Organisation (BRO) would open the roads by the time we got there, we set out to Narkanda. The roads going up there were full of smooth tarmac and lovely twisties. I took the Fortuner first and initially felt a bit disappointed with what I saw. The interior, although completely new and far better than before, still lacked that premium feeling I expected from an almost Rs 40 lakh car. If there was one word to describe it, it would be functional. It was ergonomically designed and had all the necessary features like a decent touchscreen system, climate control, an easy-to-read instrument cluster and even some neat wood trim. But functional alone doesn't make the cut in this segment  you expect creature comforts. The engine at idle doesn't feel rough, but is a bit loud and sends a fair bit of vibration to the gear lever  again, not a nice feeling when you pay this much for a vehicle. But once I got moving, everything seemed to smoothen out and I was happy again. The Toyota engine offers strong performance with 420Nm of torque peaking from as low as 1,600rpm all the way to 2,400rpm, while 177PS of max power comes in at 3,400rpm. Throttle response is crisp and makes you feel in sync with the engine, while the well-thought-out gear ratios in first and second (we had the 6-speed manual) ensure you're not bogged down while climbing up slopes. In fact, I never found myself having to go down to first even while climbing up steep slopes at slow speeds  there was always enough grunt in second and third gear. I found the Fortuner's handling around the bends to be quite impressive too. When you're sitting in a car that's got a ground clearance of 220mm, you'd expect an unnerving amount of body roll when taking a corner at high speeds. But with a little faith, I pushed a little harder and it still stayed controlled. Steering feedback is impressive and feels well weighted too. But at slower speeds this can get a little heavy to use. 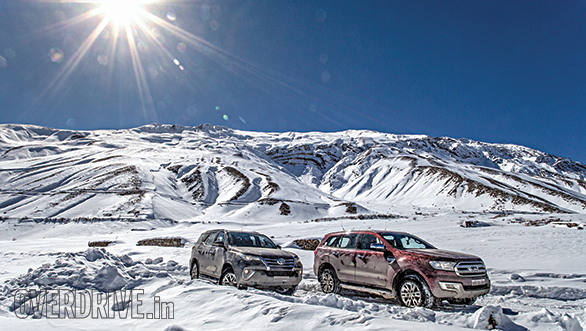 By lunchtime I emerged from the Fortuner quite happy and decided to swap cars with Rishabh. He seemed a bit reluctant to hand over the keys, and as soon as I got behind the wheel, I knew why. Everything about it felt far more luxurious. The interior design was far nicer with a more premium look and feel, while the lighter colours make it look a bit roomier. The part digital instrument cluster isn't the easiest to figure out at first, but once you get used to it, you'll find that it offers quite a bit of information. Once on the road, it was even more impressive. The 3.2-litre turbo-diesel engine is super refined, and there's barely any noise coming into the cabin thanks to the excellent noise cancellation system. In fact, it's hard to tell if the engine is even running at idle! 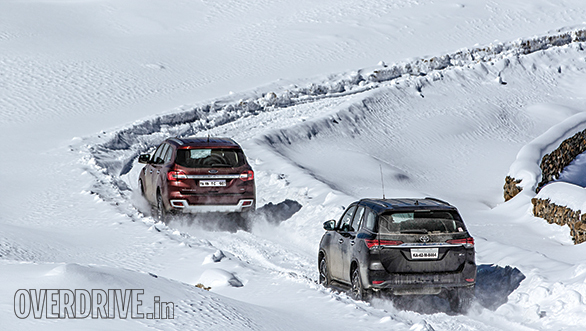 Everything the Fortuner did, the Endeavour seemed to do that much more effortlessly. The slick 6-speed automatic gearbox (there is no manual option with the 3.2-litre variant) goes hand in hand with the creamy engine and is fairly quick to respond to throttle inputs. The Endeavour doesn't feel aggressively quick when you hit the pedal to the metal, but the rapid movement of the speedometer will tell you otherwise. 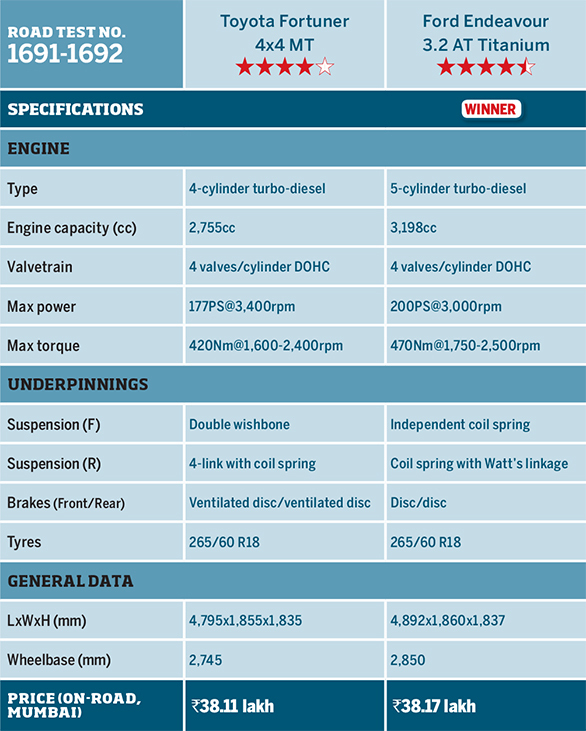 The torquey engine puts out 470Nm from 1,750-2,500rpm, while its peak power of 200PS is churned out at 3,000rpm. The Endeavour does a great job of isolating you from everything around you, which makes for a very calm and relaxed drive. Around the bends, it would handle just as well as the Fortuner with hardly any body roll. The steering weighs up very well and offers good feedback. Within half an hour of driving the Endeavour, I was almost convinced that we already had a winner. The Fortuner was clearly the underdog here. But Kaza had other ideas. By the time we got to Pooh, the temperature had gone down to a biting 0°C. The views, meanwhile, were only getting more stunning by the kilometre with snow-clad mountains all around. Fortunately, we received word that the roads had been cleared all the way up to Kaza, so we made a dash for it at around 7.30am. 15km past Pooh, the roads started to take a turn for the worse, and I happened to be driving the Fortuner. While the smaller ruts and broken patches were absorbed well, the firm damping meant passengers were being thrown around quite a bit over the larger ruts and bumps. Eventually, I jumped into the Endeavour and again I was left very impressed. The Endeavour's smart road manners hadn't affected ride quality at all! The supple damping absorbed everything in its path, barely letting any of the movement get to the cabin. It felt like a proper luxury SUV. 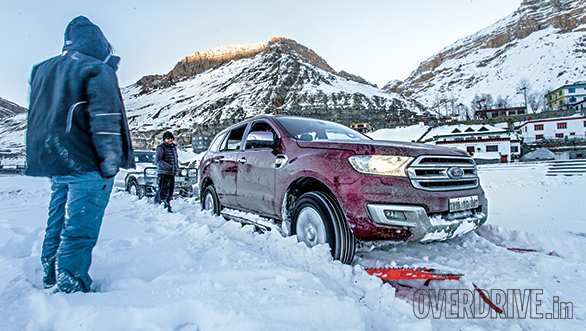 Pretty soon, the entire crew made it obvious which their choice of car was for rest of the journey  the Endeavour. Again, things seemed to look rather glum for the Fortuner. 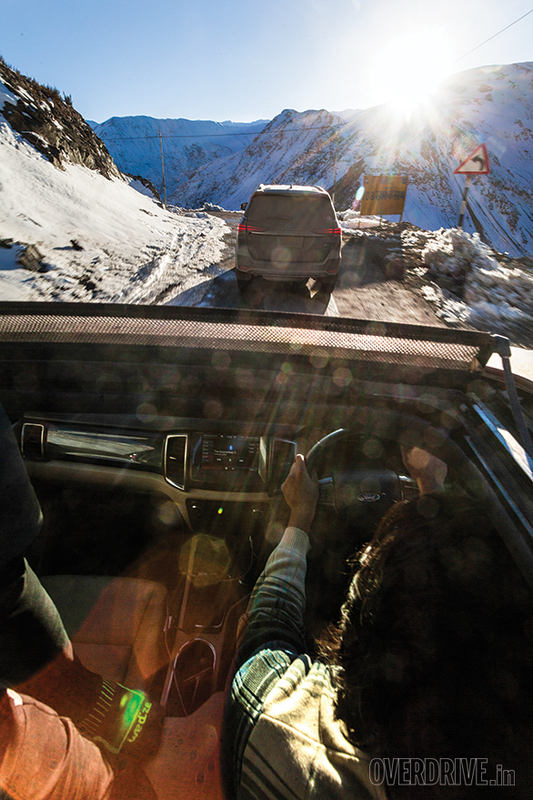 But as the sun began to set and we hit snow, things started to change in favour of the Fortuner. Snow isn't like any surface you've driven on before. One moment you're driving straight with good traction and the next you're tramlining into the snow banks, because of the grooves in the snow. It's quite unnerving initially, but it happens so often that, after a while, you just ignore it. You have to keep momentum in these conditions. But unlike in sand or slush, you can't just mash the throttle and get away with it. Gentle throttle input is the only way you'll keep your wheels from spinning up, and gentle braking is the only way you won't lose traction and drive off a cliff. 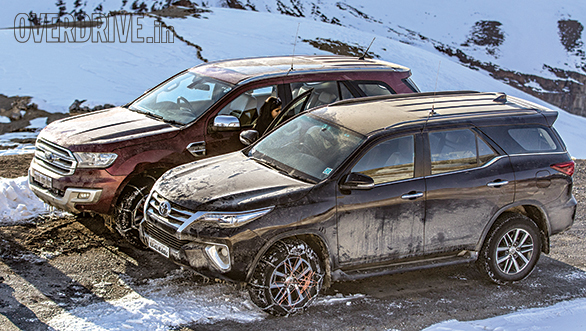 Unlike the older Fortuner and the current Endeavour, the new Fortuner one doesn't get AWD. Instead, it's rear-wheel driven like the Innova. It's not a deal-breaker really, because efficiency is significantly better, and you can always shift to 4-high using the electronic shift-on-the-fly transfer case. 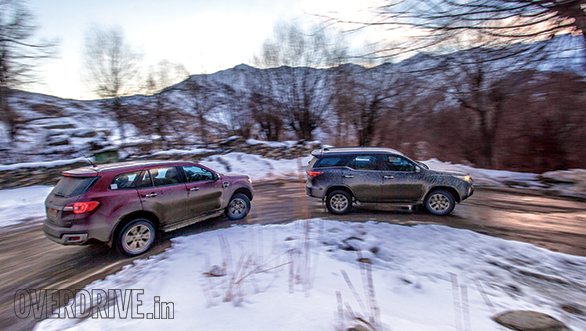 By the end of the day, we realised that for every quarter tank that the Fortuner consumed, the Endeavour guzzled almost half a tank of diesel in the high altitude  and both of them have 80-litre tanks. The Endeavour's AWD system features Ford's Terrain Management System. It has four modes  Normal, Grass/Gravel/Snow, Sand and Rock. In Normal mode, the system distributes power in a 60:40 split to the front and rear wheels, and optimises throttle response keeping in mind efficiency and performance. Grass/Gravel/Snow, which we used most of the time, reduces throttle sensitivity, while the gears shift up earlier and downshifts later, making it more predictable. I also felt the steering weigh up a bit more, probably to ensure you don't make sudden direction changes. Sand mode increases throttle sensitivity, which allows for the wheels to spin up easily, thereby keeping momentum. Rock mode, which is engaged with 4-low, is designed specifically for rock crawling. 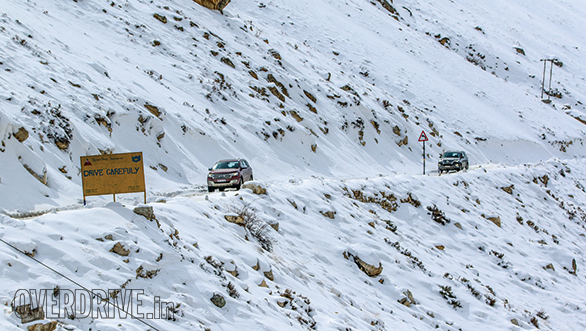 But even with these complicated systems, I didn't feel as confident in the Endeavour as I did in the Fortuner on snow. Remember how I said the Endeavour isolated you from everything? Well, that just came back and bit me. Like I said earlier about the Fortuner, I felt in sync with the engine, and was quite confident while delivering gentle and steady throttle inputs. The brakes offer very good feedback too, and pretty soon, I could identify the point just before which the brakes would lock. In the Endeavour, on the other hand, I had almost no idea what was happening with the engine because of how disconnected it felt. I found myself spinning up the wheels more than I did in the Fortuner too. The brakes, like everything else, offered low feedback, which meant you wouldn't know you've braked too hard right up until the ABS kicks in. Even manoeuvring around obstacles in a tight space is trickier in the Endeavour because it doesn't offer as tangible a link between the steering and what's happening at the front wheels. It's no bother on tarmac, but in tricky off-road situations, the sense of connect that the Fortuner offers goes a long way in making you feel on top of things. 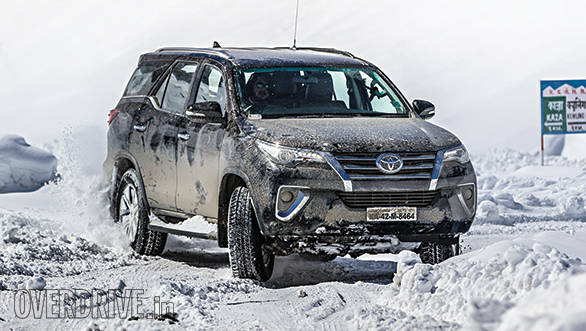 Additionally, the Fortuner feels a little old school and more rugged than the Endeavour, which I personally love. 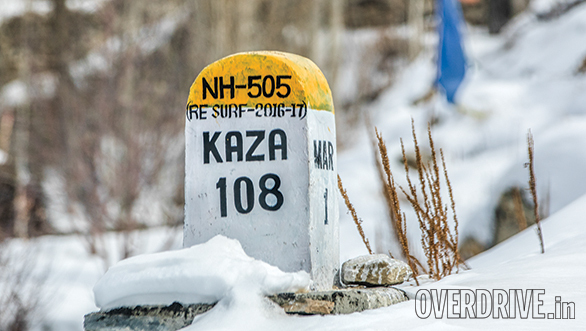 The roads in the last 75-odd kilometres from Sumdo to Kaza were covered with hardened ice and had snow banks on either side. While it was too dark outside to see the Spiti River that we were travelling parallel to, we could tell that it was a long way down thanks to the snow on the large mountains reflecting the moonlight. Was it beautiful? Oh, most certainly. Was it scary? You can bet your pants it was! To make things worse, we were travelling through several rock-fall and landslide zones. Tiny rocks (or so we hoped) would roll down the mountainside and hit our cars too often for comfort. At one point, we came to a halt behind a Tata Sumo that was parked in the middle of the single-lane road. The driver, who was a Kaza local, was waiting for a bunch of other taxis, which we had passed quite some time back. The driver didn't seem to understand why we would willingly visit Kaza at this time of the year. Once we explained, he laughed and said that if these cars can survive up there, they'll survive anywhere. By the time we reached Kaza, it was 9.00pm and almost -20°C. When morning came, it was time for the first test  the cold start. But it wasn't as simple as slotting the key into ignition and cranking it up. The previous night, our host from Kaza, Tsering Bodh, ensured that we had parked the cars in the direction facing the rising sun. So as soon as sun light hit the cars at around 9.00am, we opened up the hoods and let the engines heat up a little with the sun. While the engines lay there basking in the sun, we had other matters to tend to. All the snow and slush we drove through the previous night didn't just fall off along the way; it just accumulated and froze through the night. The wheel arches had so much ice that it was just a couple of millimetres from the tyre, while plenty of ice had accumulated on the axles. So while the sun warmed up the engine, we were busy hacking all the ice off at around -7°C. Not really my idea of a perfect morning. When it was time to start the engine, we heated it up eight times using the ignition switch before cranking it up. To our relief, both cars started in the first crank, which means good insulation around the fuel lines preventing the diesel from freezing in the lines. With that sorted, we hit the road. I had last visited Kaza in November 2016 and was very eager to see the same sights in winter. And man, was I speechless! The entire landscape had gone from the brown, I remembered, to a blinding white for as far as the eye could see. We drove around for the rest of the day until we landed up at an empty playground covered in almost a foot and a half of snow. It was time to find out which one was the better off-roader. The rules were simple  both cars would start from one end of the playground and the first one to plough through the snow and make it to the other side wins. We were allowed to use traction boards, and we had Rana's car to winch us out in case we got stuck. I was in the Fortuner, while Rishabh was in the Endeavour. The idea was to engage 4-low, push through as much as snow as possible, back up and then push some more. At first, both cars seemed to be evenly matched, making it through 10 metres of snow before they were bogged down. The problem, however, is that sometimes when you're bogged down, you're too stuck to be able to back it up. That's where the Fortuner, with its manual transmission, scores again. A useful off-roading technique when you get stuck is to rock the car forward and backward, building enough momentum to get out of the rut. With a manual, that's simple  accelerate a bit to push the car up one slope of the rut, and quickly depress the clutch, sending it down the rut and back up the other side of the rut. Do it enough times and you'll find yourself free. In the automatic, that's just not possible. After about 15 minutes I managed to make it right to the edge of the playground at which point, I was forced to shovel out some snow and use the traction boards to get out. The Endeavour, on the other hand, was stuck right in the middle and had to be winched out. A clear win for the Fortuner! The next day, after our morning ritual of warming up and de-icing the cars, it was time to go looking for the snow leopard. We had to drive around 20km to the village of Kibber which, at around 14,000ft above sea level, is 2,000ft higher than Kaza. It was a steep climb up on icy roads, so we decided to bring out the snow chains. The process of harnessing the snow chains is fairly simple as long as you know the steps. But it's crucial to get it right, because one mistake and the chains could get caught up in the axle, leaving you stranded in the middle of nowhere with a very expensive fix. Even with clear skies and plenty of sunlight, it took us a while to get the snow chains on  I can only imagine how hard it must be when the Mother Nature isn't as kind. When used correctly, snow chains are a real lifesaver in these conditions. They break the ice between the tyre and the road, thereby ensuring you don't slip and slide all over the place... or off a cliff. On our way up, we expected to hike a couple of kilometres to find the snow leopard. But as we got closer to Kibber, we saw a group of excited locals pointing at something at the bottom of the nala. We pulled up and couldn't believe our luck. Around 100 metres from the road, we saw a snow leopard fast asleep in a crevice, after a recent meal. We spent hours there hoping it would move, but it just ignored us and continued to rest. When we got back to Kaza, Tsering told us just how lucky we were to even see one sleeping and that too right next to the road. He told us of how many people he'd met that had spent months looking for one with no luck at all. Our mission accomplished, with ridiculous luck, it was time to head back. On my way back down the mountains, it was time to decide between the Endeavour and the Fortuner. It wasn't as easy as I had initially thought it would be. 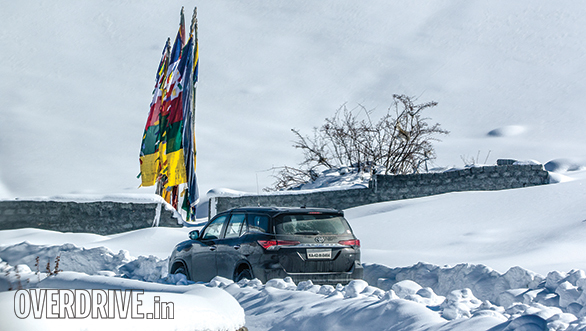 As soon as we got on really rough terrain, the Fortuner proved its worth. It's not as good on the road, but is certainly the better off-roader here, especially with that manual gearbox, something you can't have with the more powerful Endeavour. That said, the Endeavour got us through the same treacherous conditions to the same breathtaking destination. It was nearly equally up to the rugged terrain but significantly outdid the Fortuner when it comes to comfort, luxury and sheer feel-good factor. 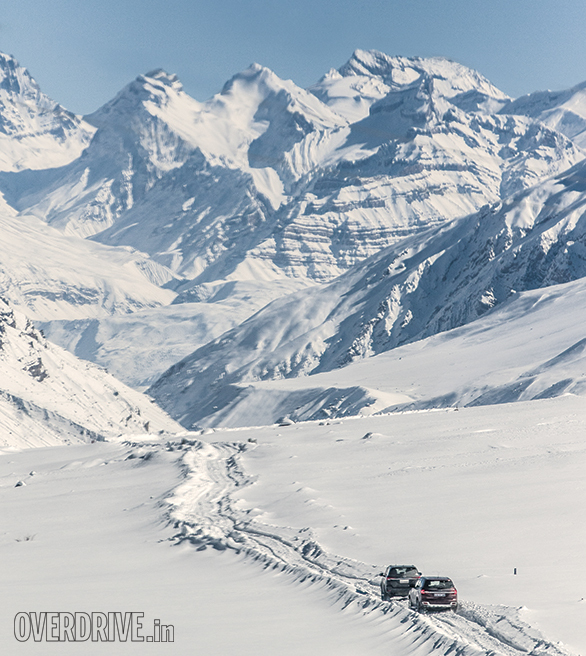 And that begs the question  if I did own one of these SUVs, how often would I go on an expedition like this one? The Fortuner makes for the better adventure explorer but the Endeavour outdoes it as a real-world SUV. The undeniable fact is that these SUVs will mostly be driven on tarmac, and only some will occasionally kick up the dirt. Then comes the price. The 3.2-litre Endeavour will cost you Rs 38.17 lakh, on-road in Mumbai. That's just Rs 6,000 more than the manual Fortuner (the automatic variant will cost you Rs 39.43 lakh). For that price, you get a better overall vehicle that feels more premium. If outright capability was my priority, I'd pick the Fortuner. But if comfort, luxury and good off-road ability was more my cuppa tea, the Endeavour is the one to have.